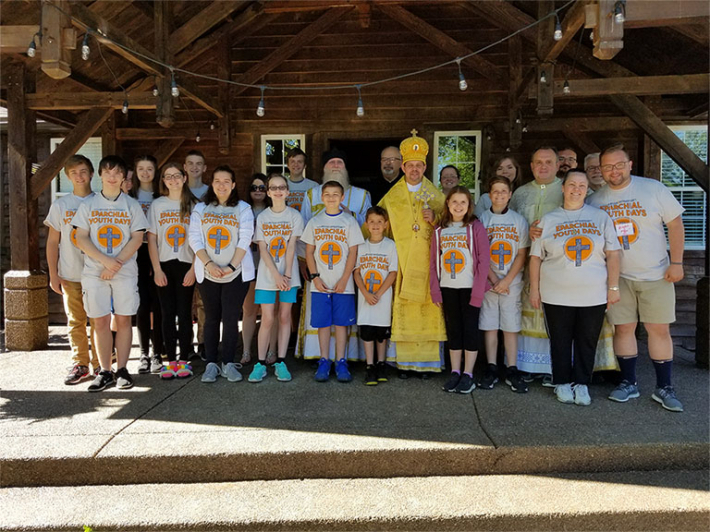 Over 30 youth, young adult leaders, volunteers, and clergy from the Ukrainian Catholic Eparchy of St. Josaphat in Parma gathered together on June 14-15, 2018 at Cheeseman Farm in Portersville, Pennsylvania (USA) for the annual Eparchial Youth Days. The theme of this year’s event was “Prayer Without Ceasing” taken from the First Letter of St. Paul to the Thessalonians: “Rejoice always, pray without ceasing, in all circumstances give thanks; for this is the will of God for you in Christ Jesus” (5:16-18) and was dedicated to the year of Liturgy and prayer in the life of the Church – an overarching theme that the Ukrainian Catholic Church has chosen to focus on in 2018. The youth event – led by Bishop Bohdan Danylo, Eparch of the Ukrainian Catholic Eparchy of St. Josaphat in Parma – was organized by the Eparchial Youth Committee under the leadership of Fr. Lubomyr Zhybak, the committee’s head and pastor of Holy Trinity Ukrainian Catholic Church in Youngstown, OH and St. Anne Ukrainian Catholic Church in Austintown, OH and the Eparchial Youth Days Coordinators: Subdeacon Joseph Zappernick of St. Andrew Ukrainian Catholic Church in Parma, OH; Mr. Joseph Levy of St. John the Baptist Ukrainian Catholic Church in Pittsburgh, PA; Mr. Michael Levy of St. Andrew Ukrainian Catholic Church in Parma, OH; as well as Ms. Victoria Diana of St. Anne Ukrainian Catholic Church in Austintown, OH, member of the committee. It provided an opportunity for the youth to have a liturgical and prayerful experience in the spirit of the Ukrainian Catholic faith and fellowship. The participants were welcomed with warm hospitality by the Cheeseman Farm staff and family. The Cheeseman Farm camp site is located near the McConnells Mill State Park and offers rustic cabins and hillside huts, hiking trails, scenic vistas, and a picturesque creek. The two-day event began with a Third Hour prayer service followed by a welcome and orientation conducted by Joseph Levy, after which the participants had a hearty lunch. Following the meal, everyone took part in an inspiring, lively, and engaging presentation on the prayer life led by the members of the eparchial Office of Family and Sanctity of Life, Brothers of the Holy Spirit, Dale Sefcik and David Robert. Brothers Dale and Robert focused on the meaning of prayer in the life of a believer that was met by the participants with attentiveness and ardor. Afterwards the youth took part in some outdoor sports activities, including ‘bubble bump soccer’ – a game in which participants play soccer while incased in inflatable plastic bubble suits that also included climbing a Velcro soft stick wall. The soccer concept and outdoor activities were greatly enjoyed by everyone. After open-air activities, everyone took part in an examination of conscience, led by Fr. Ihor Hohosha, Pastor of St. George Ukrainian Catholic Church in Pittsburgh, PA and of St. John the Baptist Ukrainian Catholic Church in McKees Rocks, PA that was followed by individual confessions heard by Bishop Bohdan Danylo; Msgr. George Appleyard, retired eparchy’s Protosyncellus; Fr. Mike Polosky, current eparchy’s Protosyncellus and Pastor of Sts. Peter and Paul Ukrainian Catholic Church in Ambridge, PA and of Sts. Peter and Paul Ukrainian Catholic Church in Aliquippa, PA; Fr. Ihor Hohosha; and Fr. Lubomyr Zhybak. After the confessions, everyone had an opportunity to take part in a ‘prayer hike’ through the area’s picturesque landscapes during which a Vespers was sung by the youth, young adult leaders, and clergy. It was a unique and spiritually moving experience, which everyone enjoyed. The retreatants also participated in a project, coordinated by Joseph Levy and Theresa Levy of St. John the Baptist Ukrainian Catholic Church in Pittsburgh, PA, during which the youth made “chotky,” i.e. traditional Eastern prayer ropes that were blessed by Bishop Bohdan the following day at the conclusion of the Liturgy. The first day ended with a ‘Ukrainian style’ camp fire – vatra – in which the youth enjoyed skits and fellowship that concluded the first day of the youth event. The second day of the Eparchial Youth Days began with a First Hour prayer followed by a Divine Liturgy, presided over by Bishop Bohdan Danylo and concelebrated by Fr. Lubomyr Zhybak and Deacon Kevin Bezner of Charlotte, North Carolina, who is currently working on establishing a Ukrainian Catholic mission in Canton, NC. In his homily during the Liturgy, Bishop Bohdan encouraged the young people to establish “an on-line” prayer connection with the Lord that would help the youth to lead joyful life of the followers of Christ. After the Liturgy, everyone had breakfast, which was followed by an inspiring presentation by Deacon Kevin Bezner, who shared with the participants his own prayer experience that was supplemented by the elements of some of the Eastern Churches’ prayer tradition. At the conclusion of the event, the youth competed in the customary “Who Wants to be a Millionaire (Religious Edition)” game. The game challenged the youth vis-a-vis their knowledge of the Sacred Scripture, Catechism, Tradition, and history of the Ukrainian Catholic Church, and encouraged them to learn more about their faith. The Eparchial Youth Days was a wonderful, prayerful, and engaging event for the youth of the eparchy. The next gathering is planned for June 2019 at Cheeseman Farm in Portersville, PA.